Hey, it's not important! It's not gonna affect america now is it? They care more if Bin Laden is dead from the earthquake or not. Who bl**dy cares about the mocked-up threat named Bin Laden? I must however add that some people have been very supportive and encouraging. Asad General 1 comment only?! Well, I went to NIIT today. The DG was insistent on making us take classes. Even Dr. Waqar didn't knew about classes being held today and came a period late. He then cancelled his second class. 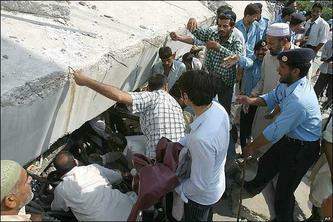 The Margalla Tower collapse incident has been quite a shock. One feels surreal when passing that building since I have seen it plenty in passing before the incident occured.